Therapy Center would like to spotlight our amazing speech therapists as a part of Better Speech and Hearing Month. Their tireless efforts and dedication to recovery emphasizes our company’s culture of individualized treatment plans and personal care. Jessica Lemoine, speech therapist at Valley View Health Care in Marksville, Louisiana is an outstanding example of the care and compassion expressed by the Therapy Center team. When asked to share a few comments about Jessica, her mentor, Sherie Soileau, beamed with pride. 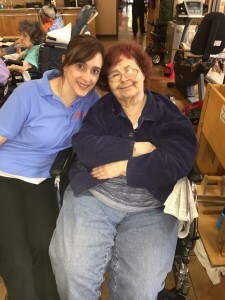 She has helped many patients throughout her career, but one of the most recent and most memorable experiences was with Mrs. Patricia, a three-year resident of Valley View Nursing Home. Mrs. Patricia enjoyed the simple things in life such as visiting with friends and reading the newspaper. Due to hospitalization at the end of last year, Mrs. Patricia returned to the facility with diagnosis of dysphagia, NPO with peg tube placement. Recognizing the importance of full recovery for Mrs. Patricia, Jessica immediately put her on a therapy program consisting of electrical stimulation, thermal stimulation and swallowing exercises to treat her dysphagia. The road was long and often frustrating, with Jessica constantly giving encouragement and being creative in her treatment approach. After two months of intense therapy, they both received great results from the Miller Behavioral Style Scale (MBSS). After initial therapy sessions, Mrs. Patricia was able to eat a puree diet with thin liquids and accomplished another diet upgrade in March 2015. With the goal of consuming a regular diet in mind, Jessica and Mrs. Patricia continued to work hard together. On April 24, 2015 their wish came true when Mrs. Patricia passed her MBSS, resulting in her ability to eat a regular diet with thin liquids. Mrs. Patricia is happier than ever living at her prior level of function. When asked what she would like to say to Jessica, Mrs. Patricia stated, Thank you very much for all of your help, I really appreciate everything! Learn more about the speech therapy services we provide to our nursing home rehabilitation patients.